On the last night of January, I participated in a rather interesting hour of radio, during which Hlomla Dandala hosted a interview with me and someone claiming to be a faith healer. The faith healer’s name is Pastor Louisa, and you can find some information on her ministry – which includes curing people of AIDS – on her website. I do have a recording of the show, but haven’t yet found a way to convert it into something that plays outside of the TuneIn Radio app on my phone (informed advice on this is welcome) – if I do get it converted, I’ll be sure to post it here. What became clear fairly on in the show is that Louisa is not a charlatan, in the sense that she’s knowingly exploiting others. She was desperately sincere, and also, unfortunately, sincerely confused. When invited to facilitate a miracle over the phone to someone who called in, she engaged in a few minutes of shouty, enthusiastic prayer and exhortations to be confident and inspired, after which she asked the caller whether she “felt better”. Yes, said the caller. I then asked – “so, does that get added to your list of miracles performed?”. Yes, said Pastor Louisa. On those weak standards, all of us perform dozens of miracles every day – just figure out what language people like to hear, or what buttons they like pushed, make them happy, and then claim to have performed a miracle! Also, she made it clear that she never tells people to stop taking their medicine. Dandala asked her how she knows whether it’s the prayer or the medicine that heals… and the predictable answer that she gave was that she “just knows”. As far as I can determine, then, she gives her god the credit for the job performed by modern medicine. You’ve heard how this (faith healing) works before, I imagine, or rather, how it doesn’t work. On the recommendation of Dan Dennett, I watched the documentary Marjoe a few years back, and it’s a wonderful expose of charismatic preachers and healers, involving Marjoe Gortner taking a documentary crew behind the scenes of his final revival tour, held after he had already lost his faith. Watch it if you can, but basically, if people want to believe something strongly enough, it’s difficult to stop them doing so. The difficulty in talking to Louisa was in resisting the impulse to mock, but instead to feel sympathy for her confusion, and the desperation of those who take her seriously. I failed in this effort at least once, when she spoke about how she had to stop talking to us because she was out in the open, under a tree, and it was cold (this was late at night). I suggested that a miracle might sort this out – after all, if she could cure Aids, what’s the problem with a little heating? Failures of good grace aside, these people can be dangerous, especially in communities we don’t often hear about, where faith healers and other quacks can do their thing without being exposed to scrutiny. Communities like the Amish are a similar problem. And the overarching problem we all have in a constitutional democracy is in striking the balance between objective application of the law and respecting the various freedoms we believe people are entitled to, like subscribing to and practicing a religion. For adults, there’s less of a concern regarding people being free to harm themselves than there is for children, who can’t be expected to know any better. But desperation, and poor educations, mean that adults are also sometimes more gullible than one would like, which is why it’s incumbent on all of us to speak out against quackery where we find it, while still trying to avoid being gratuitously cruel to those we criticise. And those of us in positions of authority should perhaps be most careful, because their trust is vested in us, and they spend money, time and attention on us. Someone getting a lot of attention right now is Professor Tim Noakes, as he goes around South Africa giving talks and radio interviews to promote the book he’s recently co-authored, The Real Meal Revolution. During a recent interview with Redi Tlhabi, he informs listeners (at 38m40s) that there is “absolutely no risk” involved in cancer victims trying the ketogenic diet, because it’s proven that starving cancer of carbohydrates is an effective treatment. Many scientists have tried killing tumors by taking away their favorite food, a sugar called glucose. Unfortunately, this treatment approach not only fails to work, it backfires–glucose-starved tumors get more aggressive. This is only true for some glucose-starved tumours, to be sure, but it still means that saying “absolutely no risk” is absolutely untrue, and that Noakes is giving advice – to an audience of thousands – that stands a good chance of harming a listener who happens to have the sort of cancer that responds aggressively to a low carbohydrate diet. As I’ve said many a time, this isn’t the approach of someone who is a responsible scientist. 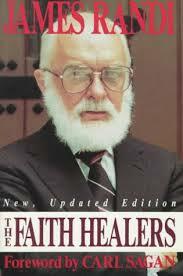 But, just like the faith-healer, I think he’s utterly sincere, and utterly committed to fostering our good health. More the pity, then, that he’s unable to see how his religious fervour might end up achieving the opposite goal, at least for some. And how – consistently – he’s wreaking havoc on basic principles of critical reasoning, and setting a terrible example for budding scientists everywhere.